Guest keynote luncheon speaker, Cherie Berry, addressed the attendees and presented EDIFICE with a Platinum STEP (Safety Training Evaluation Program) Award. A Platinum award signifies a Safety Experience Modification Rate (EMR) of 0.8 or less (typically lower than the industry average). 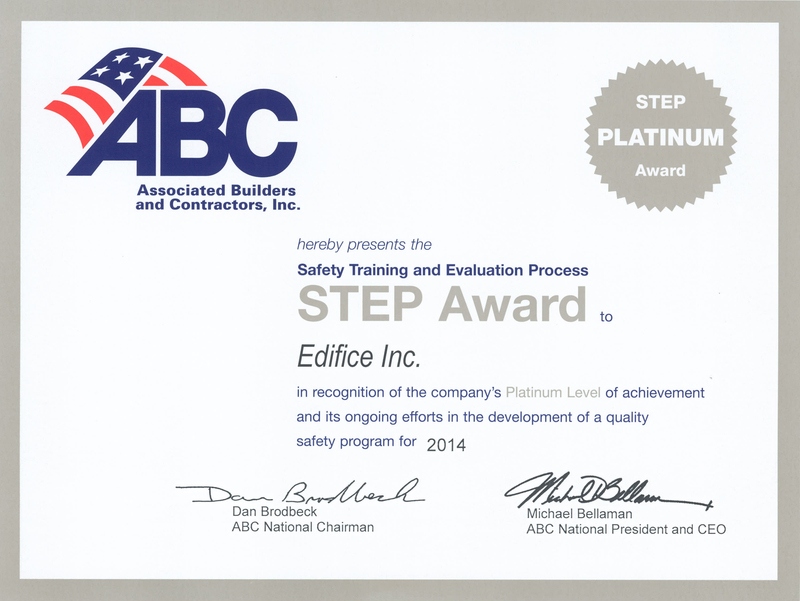 Established in 1989 by the ABC National Environment, Health & Safety (EH&S) Committee, the Safety Training and Evaluation Process (STEP) program was developed and written by contractors, for contractors. Associated Builders and Contractors of the Carolinas represent the merit construction contractors and related firms in the Carolinas as a chapter of ABC, a national association representing more than 26,000 members.